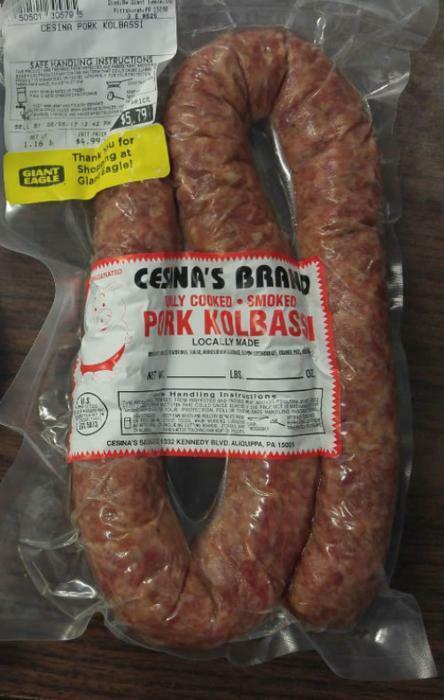 Cesina Sausage Company of Aliquippa, Pa., is recalling approximately 10 pounds of pork sausage (kolbassi). The product label identifies this product as ready-to-eat when, in fact, it is not. There are no confirmed reports of adverse reactions due to consumption of this product. The recalled product, bearing establishment number “EST. 5073” inside the USDA mark of inspection, was shipped to a grocery store in Aliquippa. Consumers questions about the recall may contact William Costanza at (724) 375-2450.